Former US Senator comments on controversy surrounding Rep. Ilhan Omar and her anti-Semitic comments. 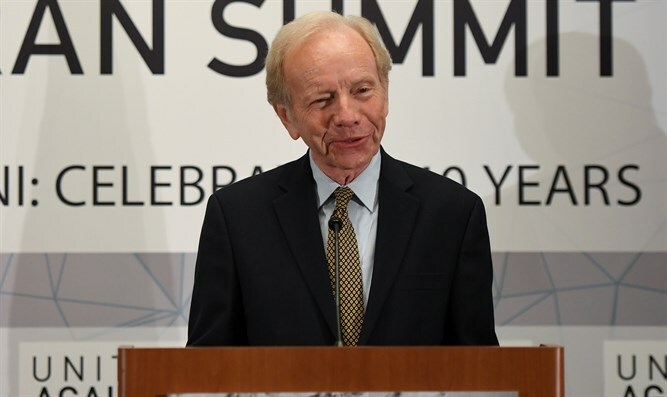 Former US Senator Joe Lieberman, a Democrat who later became an Independent, said in an interview broadcast Sunday that the Democratic Party "is not an anti-Jewish party" but that it has members who say anti-Semitic things, The Hill reported. "The Democratic Party is not an anti-Jewish party, but there are some people in the party now, including in Congress as we've seen from Congresswoman Omar...who are saying explicitly anti-Semitic things," Lieberman, who is Jewish, was quoted as having said in an interview on AM 970 in New York. He was referring to the anti-Semitic remarks by Rep. Ilhan Omar (D-MN) which caused an uproar in recent weeks. “I think it is very important for the House to act and act directly. It sounds like the resolution that they are drafting now which was originally against anti-Semitism all though clearly it was engendered by what Congressman Omar had said is being broadened to be a statement against anti-Muslim bias. Of course, we should make that statement but I think the House could do better,” he told Fox News Channel. "I say this is a moment of testing, moral testing. Speak clearly about it. Make clear to the congresswoman that she went over the line, it’s unacceptable. And you make clear to the next person who is thinking about expressing some other kind of bigotry that it’s not going to be tolerated,” added Lieberman.